In my attempt to try and eat healthier food (takeaway pizza and Nando's every day does not a healthy girl make! ), I've been looking through my Bill Granger books. 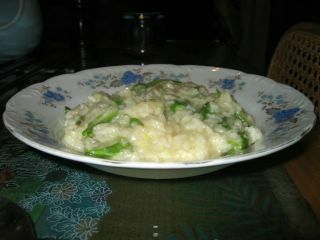 Last night, we had crab and asparagus risotto, from bills food. 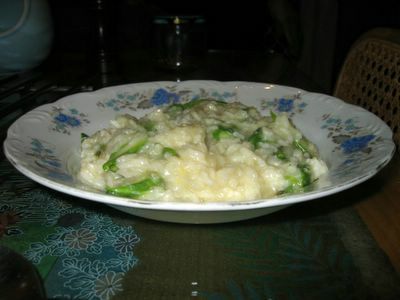 It is an ordinary risotto, with finely sliced asparagus, crab meat, lemon juice and lemon zest added at the end. I used twice the amount of asparagus that the recipe asks for, because I wanted to use it all up. I also used tinned crab (terrible, I know), which tasted fine, but broke down in the risotto, so you couldn’t see any pieces of crab. Next time, I’d probably try firm fresh crab, lobster, scallops or prawns – so that you’d be able to see in the finished dish. It tasted great! It was so easy, but very luxurious at the same time. Definitely a keeper. I work with Bill and will tell him about your risotto experience! I don't know which country you are in, but if you are in the UK, we just launched his latest book : Every Day. Keep enjoying the cooking....and stay away from the take-away menus! Yeah, the risotto tasted fine! The only problem was the texture (or lack thereof, lol). Actually, I've found that tinned crab works really well in Nigella's linguine with chilli, crab and watercress (Forever Summer), so give it a go if you get a chance! Fantastic recipe!! I shall have to give that one a go.. Tried Bill's Crab & Asparagus Risotto: added the lemon juice as instructed but only added a small amount of of lemon zest and quite frankly it could have been mistaken for lemon risotto! The crabmeat flavour was completely overpowered by the lemon which is disappointing to say the least when considering the price of crab meat.